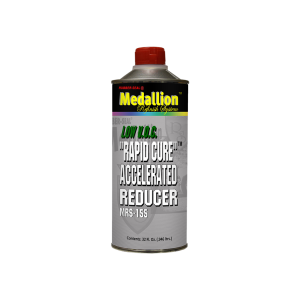 MRS-155 Rapid Cure Accelerated Reducer is designed to increase productivity and thru-put when temperatures are 70°F (21.1°C) and below. This reducer decreases cure times and dry-to-sand times as much as 50% with not affect on pot-life and sprayability. MRS-155 can be used in Medallion urethane clearcoat and primer surfacers. Add 5% to ready-to-spray material (8 oz. of sprayable material add 1 capful for 5%). Designed for single and multi-panel repairs. Packaged in quarts only.